Sundays for me are a cooking day. Especially now that it is Winter. My house does not have heating, so it is nice to spend the afternoon baking sweet treats, or to have something hearty bubbling away merrily on the stove. It seems to create instant warmth. Sunday too, is my Market day. I always come home feeling inspired and wanting to cook after going to the Farmers Market. 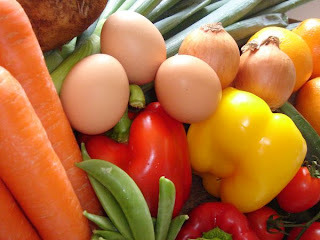 Having a kitchen full of beautiful fresh produce, why wouldn't I? Today I decided to make some home made chicken stock. I have no aversion to stock powders, but it is just so satisfying when you take the time and effort to make your own home made stock. Lucky for me time is a luxury and I have all day to do as I please while my stock does its thing. Another reason I like to make my own stocks is that it is a good way to use up some of the vegetables in your crisper that might be just past their prime. Do you ever cut the ends of a bunch of celery and think 'That would be great to put into a stock'? This is a great time to cut them up, put into a Ziploc bag and freeze them for when you have time to make stock. Fresh chicken bones and carcasses are wonderfully cheap and can be frozen ahead also. 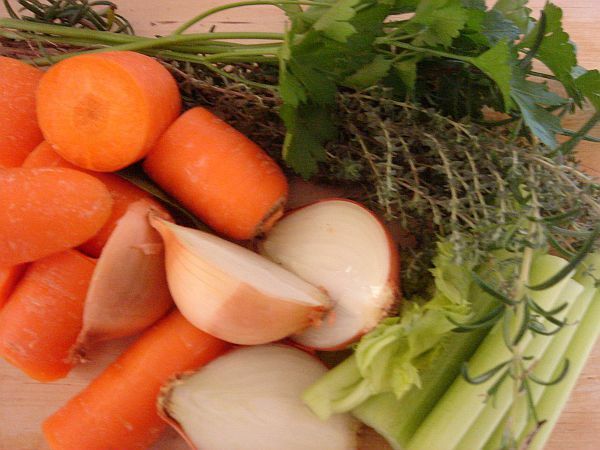 Just by being thrifty you can have a 'stock pile' (pun intended) of ingredients ready to go. Put all ingredients into a stock pot and cover with water. Bring to the boil. Turn heat down and simmer for 3-4 hours, skimming the stock as it cooks. Allow to cool, strain and portion out into containers. Freeze until required. This will yield about 4-6 litres of stock, depending on the size of your stock pot. I find leaving the skins on the onion gives the stock a nice earthy colour and flavour. As for the herbs, I am fortunate to be able to use herbs from my own garden. If using dried herbs, just tweak the quantities (about 1/4 dried to my quantity of fresh). You can also adjust to suit your own taste. Don't let me be the rule maker here! Just use me as a guide. If this all just seems too much, there is always Massell and Vegeta. They are always good as a standby, but they don't give you the sense of satisfaction and smugness that comes from making your own stock!